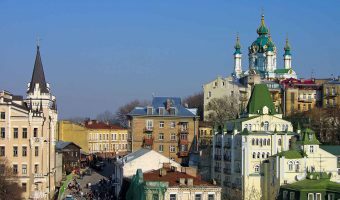 The neighbourhood of Podil was once the home of Kiev’s merchants and artisans. It is linked to the Upper Town by the Funicular Railway and Andrew’s Descent. Kontraktova Ploscha (Contracts Square) – A central square named after Contracts House, a trading centre where merchants from the Russian Empire signed trading contracts. National University of Kiev Mohyla Academy – Ukraine’s most prestigious university. Fountain of Sampson – Situated at Kontraktova Ploshcha this fountain was built in the 18th century but destroyed by the Bolsheviks in the 1934. It was rebuilt in 1981. Poshtova Ploscha (Postal Square) – Historic square, served by the Poshtova Ploshcha Metro Station. Museum of One Street – Small museum dedicated to the history of Andrew’s Descent. Funicular Railway – Offers a scenic trip between Podil and the Upper Town (St Michael’s Golden-Domed Monastery). Andrew’s Descent – Famous street packed with restaurants, galleries, and museums. 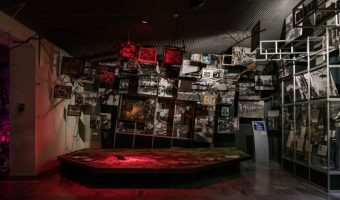 Chernobyl Museum – Tells the story of the disaster at the Chernobyl Nuclear Power Plant. Hotels and places to stay in and around this area include Podol Plaza Hotel, Hotel Staro, Fairmont Grand Hotel Kyiv, Radisson Blu Hotel Kyiv Podil, Impressa, and Amarant Hotel. Interactive map of Podil. Click on any icon for further information. Footage of some of the things you may see while in the Podil area of the city.